Reformed Seattle rockers Q5 have inked a deal with Frontiers Music Srl. Q5 was formed in 1983 by members of two popular Seattle bands: vocalist Jonathan K and guitarist (famous guitar tremolo inventor) Floyd Rose from THE C.O.R.E. and Rick Pierce (guitar), Evan Sheeley (bass) and Gary Thompson (drums) from TKO. 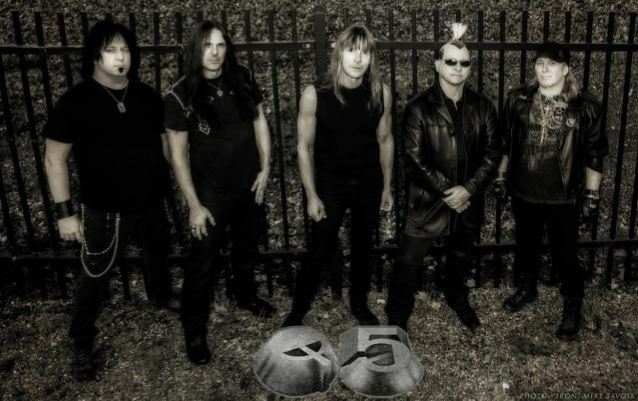 Q5 released its first album, "Steel The Light", in 1984, receiving immediate critical acclaim, and landing them tours with TWISTED SISTER, Y&T and LITA FORD. The success of "Steel The Light" led them to eventually sign with Polygram/Squawk for their 1985 sophomore release "When The Mirror Cracks", but due to personal differences, the original lineup dissolved shortly after this release. In 1991, Jonathan K and Rick Pierce started a new project called NIGHTSHADE with drummer Jeffrey McCormack and bassist Anthony Magnelli and released their first album, "Dead Of Night". This album was partially comprised of material that was to be the third Q5 release, and it received worldwide critical acclaim. In 2009, when NIGHTSHADE was slated to perform at the Headbangers Open Air festival in Germany, with Evan Sheeley on bass, the promoters asked if they would perform a second set as Q5 and the band agreed to do it. The fans response was overwhelming, to say the least! In 2014, Q5 was asked to perform at Sweden Rock Festival, a performance that the band had agreed would be a "one-off" show, but at the completion of the performance, it was obvious that this was not an ending, but merely a beginning. Upon returning to Seattle, the band secured drummer Jeffrey McCormack (formerly of HEIR APPARENT, FIFTH ANGEL) again, and guitar virtuoso Dennis Turner to complete the lineup. "Steel The Light" continues to be discovered and gain new fans all over the world. Critics are still touting the album as a "classic" and a "must-have in any metalhead's collection." Bands such as GREAT WHITE, WOLF, OCTOBER 31 and many others have covered songs from the album, and fans are writing from all corners of the globe, eagerly anticipating the next chapter in the Q5 story... That chapter begins NOW! "We are truly honored to be with Frontiers!" says drummer Jeff McCormack! With a super-strong lineup, a new label and an album slated for release in early 2016, Q5 is poised to take its rightful place in the hard rock/heavy metal history books!